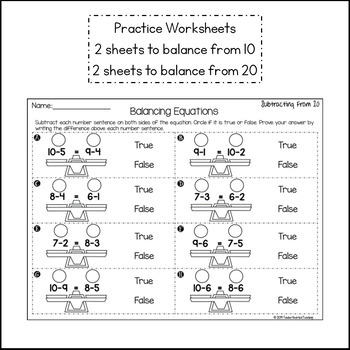 Do your students need to practice balancing equations? 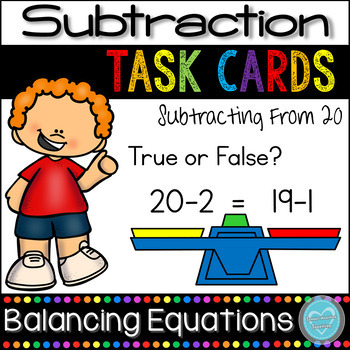 These task cards are helpful to introduce the concept of balancing subtraction equations before balancing equations with a missing subtrahend. The students are to find the difference on both sides of the equal sign. If the answer is the same on both sides, then the answer is true. If the answer is different on both sides, then the answer is false. The students can check if the equation is true or false by scanning the QR code. There are practice worksheets as well to support the child's understanding. 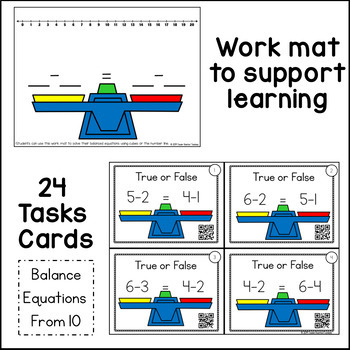 *These task cards can be incorporated in small group, math centers, or used as a review. 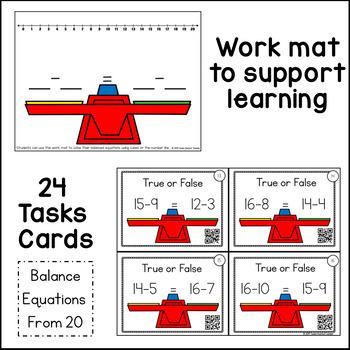 *Print the desired task card set, laminate, and cut. Place a hole punch in the top left corner of each task card. Keep the cards in order by attaching a ring through the hole punch. Students record their answers on the recording sheet. Enjoy! Work mat with a balance scale on it. Students can use cubes to build the number sentence to determine if they have the same number of cubes on both sides. Another option is to solve the subtraction number sentences using the number line located at the top.